Ice cream is a popular dessert that’s enjoyed across the globe. Blending the cold and the creamy, ice cream is an ideal treat on a hot day. According to IceCream.com, 87 percent of Americans have ice cream in their freezer at any given time. While Americans may enjoy their ice cream, New Zealand consumes more ice cream than any country in the world. Historians and foodies believe Ancient Greeks enjoyed a dessert similar to ice cream as early as the 5th century B.C. Considering ice cream has been around so long, and that many cultures have created their own take on frozen treats, from gelato to sorbet to frozen yogurts, one may think there aren’t many new ways to indulge in this beloved dessert. But with a little creativity, anyone can come up with innovative ways to serve ice cream or any of its frozen cousins. The following are just a few different recipe inspirations. 1. Lightly butter flour tortillas and sprinkle them with cinnamon and sugar. Drape the tortillas over the rungs of the shelves in an oven, placing a cookie sheet underneath to catch any drips. Bake at 300 F until just crisp. Fill with your favorite ice cream for some frozen dessert tacos. 2. 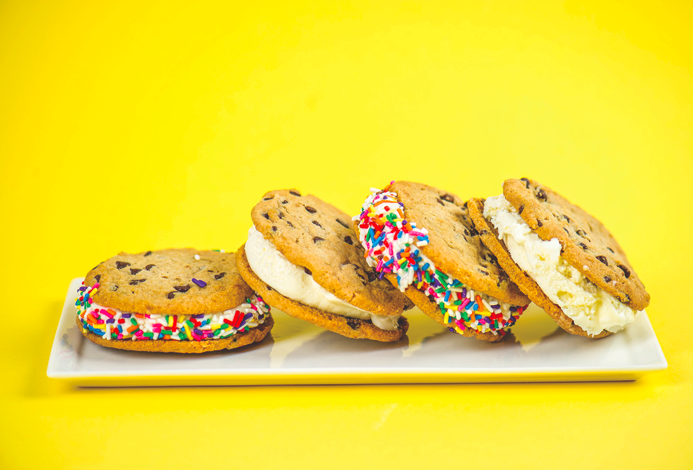 Create your own ice cream sandwiches from any firm cookies or dessert bars you have on hand. For example, cut two thin slices of fudge brownies. Spread softened ice cream in a complementary flavor, such as peanut butter or black cherry vanilla, in between the brownie sandwich pieces. Freeze to firm everything up and make it easier to eat. 3. Fried ice cream pairs the seemingly incompatible frozen dessert with heat. Freeze scoops of ice cream until they are solid, dip them in an egg wash and coat with crushed cookie crumbs. You can then refreeze the finished ice cream balls and have them set to fry in time for dessert. 4. Ice cream and frozen waffles make a quick dessert in a pinch. Raid the freezer for the ingredients, toast the waffles and then sandwich with ice cream. Top with fresh fruit and whipped cream, if desired. 5. Spoon your favorite cookie dough into a muffin tin and mold the dough so it lines the individual cups of the tin. Bake until firm and let cool. Use the cookie cups to make little ice cream sundae holders for parties. Their diminutive size makes them ideal for kids. 6. Whip up your own ice cream cake. Place a thin layer of any flavor cake on the bottom of a dish or pan that can be placed into the freezer. Scoop softened ice cream on top, then continue to layer as desired, finishing with ice cream as the final layer. Let freeze several hours until firmed up, then enjoy. Ice cream can be enjoyed in cones, cups, a la mode or as part of soda floats. There is really no limit to what can be created with this popular dessert treat.